Description: For more than four decades, biblical experts have tried to place the story of Exodus into historical context--without success. What could explain the Nile turning to blood, insects swarming the land, and the sky falling to darkness? Integrating biblical accounts with substantive archaeological evidence, The Parting of the Sea looks at how natural phenomena shaped the stories of Exodus, the Sojourn in the Wilderness, and the Israelite conquest of Canaan. Barbara Sivertsen demonstrates that the Exodus was in fact two separate exoduses both triggered by volcanic eruptions--and provides scientific explanations for the ten plagues and the parting of the Red Sea. Over time, Israelite oral tradition combined these events into the Exodus narrative known today. Skillfully unifying textual and archaeological records with details of ancient geological events, Sivertsen shows how the first exodus followed a 1628 B.C.E Minoan eruption that produced all but one of the first nine plagues. The second exodus followed an eruption of a volcano off the Aegean island of Yali almost two centuries later, creating the tenth plague of darkness and a series of tsunamis that "parted the sea" and drowned the pursuing Egyptian army. Sivertsen's brilliant account explains inconsistencies in the biblical story, fits chronologically with the conquest of Jericho, and confirms that the Israelites were in Canaan before the end of the sixteenth century B.C.E. In examining oral traditions and how these practices absorb and process geological details through storytelling, The Parting of the Sea reveals how powerful historical narratives are transformed into myth. 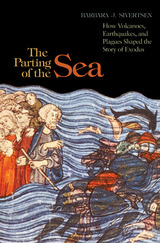 Citation: Ralph K. Hawkins, review of Barbara J. Sivertsen, The Parting of the Sea: How Volcanoes, Earthquakes, and Plagues Shaped the Story of Exodus, Review of Biblical Literature [http://www.bookreviews.org] (2019).